The so-called Copernican revolution is Kuhn’s most cherished example in his conception of the non-cumulative development of science. Indeed, in his view not only has the Copernican model introduced a major discontinuity in the history of science but the new paradigm and the old paradigm are incommensurable, i.e. the gap between the two models is so huge that the changes introduced in the new model cannot be understood in terms of the concepts of the old one. 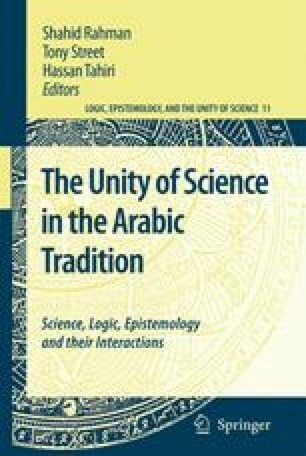 The aim of this chapter is to show on the contrary that the study of the Arabic tradition can bridge the gap assumed by Kuhn as a historical fact precisely in the case of Copernicus. The changes involved in the work of Copernicus arise, in our view, as a result of interweaving epistemological and mathematical controversies in the Arabic tradition which challenged the Ptolemaic model. Our main case study is the work of Ibn al-Haytham who devotes a whole book to the task of refuting the implications of the Almagest machinery. Ibn al-Haytham’s al-Shukūkhad such an impact that since its disclosure the Almagest stopped being seen as the suitable model of the heavenly bodies. Numerous attempts have been made to find new alternative models based on the correct principles of physics following the strong appeal launched by both Ibn al-Haytham and, after him, Ibn Rushd. The work of Ibn al-Shāir, based exclusively on the concept of uniform circular motion, represents the climax of the intense theoretical research undertaken during the thirteenth and the fourteenth centuries by the Marāgha School (which owes its name to the observatory of Marāgha in north-western Iran). The connection point, in our view, between the works of Ibn al-Haytham and Ibn al-Shā ir is that while the al-Shukūk gives the elements to build a countermodel to the Almagest, the work of Ibn al-Shā ir offers a model which takes care of the objections triggered by the work of Ibn al-Haytham. Furthermore, not only has the basic identity of the models of Ibn al-Shā ir and Copernicus been established by recent researches, but it was also found out that Copernicus used the very same mathematical apparatus which was developed by the Marāgha School over at least two centuries. Striking is the fact that Copernicus uses without proof mathematical results already geometrically proven by the Marāgha School three centuries before. Our paper will show that Copernicus was in fact working under the influence of the two streams of the Arabic tradition: the well known more philosophical western stream, known as physical realism, and the newly discovered eastern mathematical stream. The first relates to the idea that astronomy must be based on physics and that physics is about the real nature of things. The second relates to the use of mathematics in the construction of models and countermodels in astronomy as developed by the Marāgha School. The case presented challenges the role of the Arabic tradition assigned by the standard interpretation of the history of science and more generally presents a first step towards a reconsideration of the thesis of discontinuity in the history of science. Our view is that major changes in the development of science might sometimes be non-cumulative, though this is not a case against continuity understood as the result of a constant interweaving of a net of controversies inside and beyond science itself.